In Guerrero vs Figueroa motivation will be the key word for two fighters that collide in a significant make-or-break fight. Robert Guerrero is fresh off back-to-back defeats at two very different levels. The most recent being in August last year when he was beaten by the decent – but not world class – David Emmanuel Peralta. That was following a controversial points reverse to the highly rated two-weight world champion, Danny Garcia. Which Guerrero turns up could come down to how he views this fight with former WBC Lightweight ruler Omar Figueroa Jr.
Figueroa 26-0-1(18KO’s) has been inactive for 19 months, and returns to the boxing ring as a Welterweight. Having failed to shine in a pair of points victories at Super Lightweight, the Texan saw it fit to take some time away from the ring. But now in an already stacked division, Figueroa’s world title aspirations are dwindling, and they could all but disappear with defeat in New York. However, it may be the wake-up call the fighter needs. Welterweight will not be a successful venture for Figueroa, while the 140lbs weight class is likely to bring back more glory. At 34-years old, it is unlikely that Guerrero 33-5-1(18KO’s) sees this as a step back into world title contention. But his name does carry weight, and there is always the chance of more ticket selling fights with the likes of Shawn Porter, Adrien Broner or Jessie Vargas. This has the makings of an all-action contest, one in which the loser will leave feeling extremely hard done by. Guerrero may be the naturally stronger – even though neither fighter should possess enough power to finish this fight early. Strength has been a key factor for Figueroa in his career, and losing that battle could be crucial. When the contest becomes a brawl inside, the elder Californian will have the significant edge. But the feeling is that his defence is too porous to ensure he can win the fight with his strength and aggression. 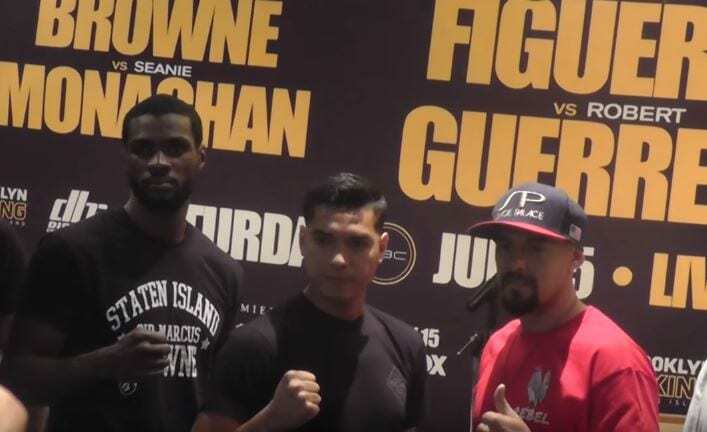 The feeling is that Guerrero will be able to endure the pace of the contest better, with Figueroa taking his foot off the gas while Guerrero still works away, looking the busier man in those close rounds – of which there will be many. Over 12-rounds, the pick would be for a wider margin of victory. But in this 10-round contest, Guerrero will hustle his way to the thinnest of decision victories. New Yorker, Sean Monaghan looked set for a world title challenge earlier this year, but that shot at Adonis Stevenson came unstuck, and now he must tough-it out to preserve his unbeaten record against fellow undefeated Marcus Browne. Monaghan 28-0(17KO’s) has looked vulnerable in the past, but his aggression and work-rate down the stretch has often forced him away from a potentially disastrous night. Browne 19-0(14KO’s) improved considerably in his last contest – a 6th round knockout of Thomas Williams Jr – showing how he can handle himself against the stronger fighter. That performance was in stark contrast to a contentious win over Radivoje Kalajdzic last April. This will be another narrow win for Browne, but this time there will be less cries of robbery and more plaudits to another showing of improvement. Artur Szpilka returns from a long absence to take on fellow Polish Heavyweight, Adam Kownacki. Szpilka 20-2(15KO’s) was impressive before he was pole-axed by Deontay Wilder last January, and it is hard to see that the second knockout loss of his career didn’t take a lot out of the 28-year old’s legs.